Let's face it; renting an apartment can be an expensive proposition. Not only do you have to come up with a security deposit, but often the first and last month's rent, as well. Then there's the cost of renting a moving van; deposits on utilities like internet, electric or gas, and cable; and the price of items like a shower curtain, wastebaskets, and even toilet paper. After paying for all that, you might not have money left for furniture! Maybe you've looked at a few furnished apartments for rent, but you're not sure whether this option is a good one. 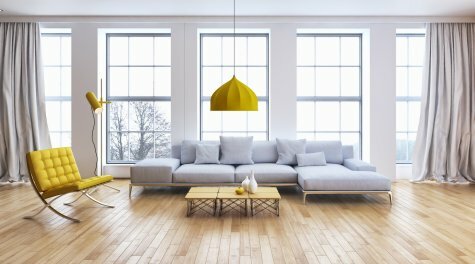 We've broken down the pros and cons of renting an apartment that is already stocked with furniture. If you've just graduated from college and are moving out of the dorms, you probably don't have the big-ticket, but necessary, items like a bed, a couch, or a dining room table. Or maybe you're moving across the country. It just doesn't make sense to pay for a moving truck just for the cast-off couch you inherited from your old roommate and a couple of particle-board shelving units. Those pieces of furniture are fairly easy to find, but why spend the money when you're already strapped for cash? Finding furnished apartments for rent can eliminate costs at a time when every penny counts. Similarly, when you are moving into a new place, you'll have enough to worry about without having to coordinate deliveries of furniture from several different places. When you choose a furnished apartment, all you have to bring is your clothing, personal effects, and a couple of bags of groceries and boom -- you're ready to go! Not sure how long you're going to be in town? Considering moving in with a friend sooner rather than later? Or just not ready to make a commitment of signing a year or two-year lease? Furnished apartments for rent allow you some flexibility in this regard. They cater to students, travelers, and others who aren't looking to settle down. And because it's less hassle to move in and out, you will be able to pack up and go whenever your situation changes. Just because your apartment comes already furnished doesn't mean that you can't personalize the place. Use posters and artwork and mementos, throw rugs, unique lamps, even Christmas lights to take the attention away from the less-attractive pieces of furniture. Furnished apartments for rent make the move-in process extremely easy when it comes to setting up your utilities, too. Often the cost of such utilities -- internet, cable television, landline phone service, water, and electricity or gas -- is bundled into the rent. You won't have to take time off for an installation rep to come "sometime between noon and five" to set up your service, you don't have to worry about signing a contract for your service, and when it's time to move, you don't have to bother canceling. Apartments with furniture used to be fairly common, but they're getting harder and harder to find these days. So you might have to scour the rental listings, and possibly even choose between furniture and another amenity -- like location or included utilities. Some places offer the option to keep the existing furniture or put it in the building's storage area, which makes for a nice compromise. You can use the furniture provided until you get your own, then stash it away. Other furnished apartments for rent might come with only a few pieces -- say, a couch and a bed, but no table. Again, this provides you a little wiggle room. This might be the biggest disadvantage of choosing furnished apartments for rent. What happens if find the perfect rental, in a great neighborhood, loaded with all the amenities you were hoping for -- but it's chock full of ugly furniture? All hope is not lost! You can buy or make a slipcover for that hideous floral couch or the overstuffed armchair that's losing its stuffing. For a super-easy solution, simply drape a big sheet over the offending item. A tablecloth or even a funky tapestry will hide a scratched-up table or a tacky headboard. And you can always ask if painting or staining is allowed. The landlords of some furnished apartments for rent, may not mind if you get creative and restore the furniture, especially if it's already seen its fair share of tenants. Will you pay more for a rental unit that comes furnished? It depends. If you're moving into a managed complex that's fully furnished, the answer is probably yes. However, there are some situations where you can negotiate a deal. With some independently owned furnished apartments for rent, it might be easier for the landlord to take a hit on the rent than to pay for (or bother with) the removal of furniture left behind by a previous tenant. Let's say that the apartment you have your eye on is tastefully furnished, with items that you might actually choose yourself, or that at least look relatively new and well cared for. That's great -- but remember that the nicer the furniture, the more your landlord will care if it gets beaten up or damaged. If you stain the mattress or couch cushions, break a table leg, or leave moisture rings on the nightstand, you won't get your full deposit back. Speaking of deposits, there's also a good chance that you will pay a higher one for your furnished apartment, for this very reason. Take good care of the place, and you'll get it back, but it's still an upfront cost to factor in. Whether a furnished or unfurnished apartment is best for you is a decision only you can make, but we can help when it comes time to actually find that apartment!